Me on one of the bridges at South Lynn, taken by David with a Voigtländer Vito B around 2006. 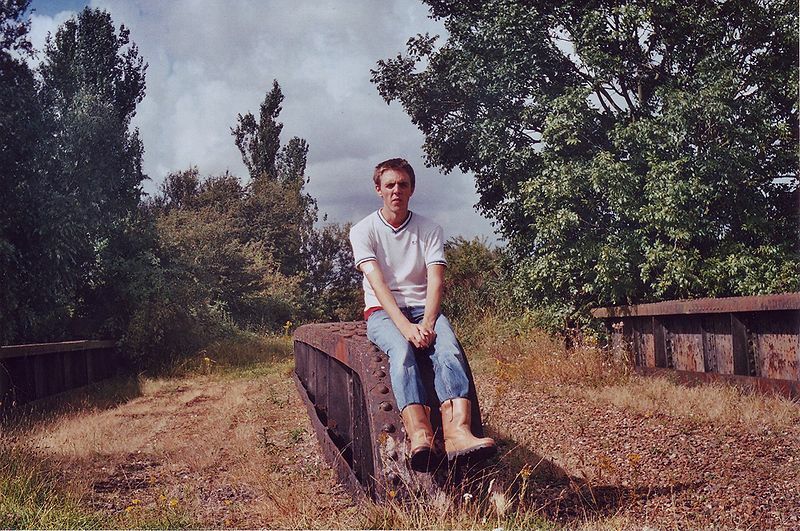 Older picture, taken around 2006. 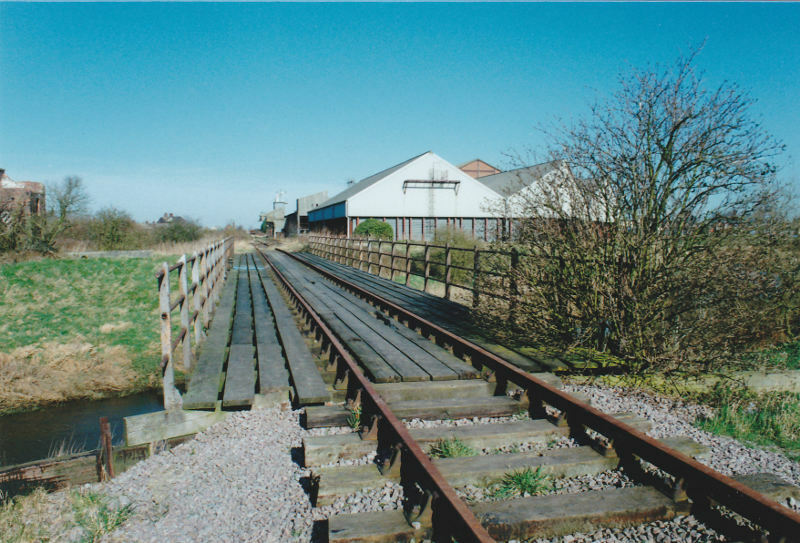 This bridge used to shuttle passengers from King's Lynn station to South Lynn station, and freight from King's Lynn yard (now the site of a Morrisons and a Matalan). 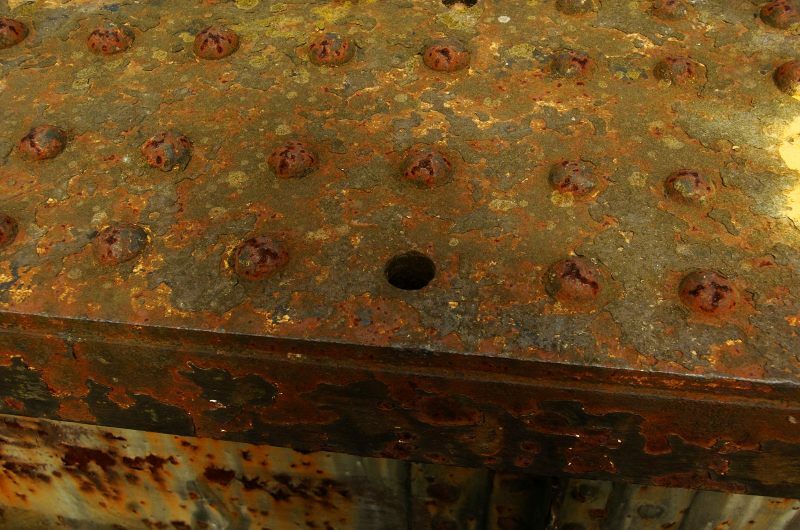 One is immediately struck by what wonderful condition the bridge is in; the only thing that hints at decay is one of the cosmetic pillars having collapsed, and the predictable (and, I think, somewhat fitting) graffiti. Today's throw-away society measures product lifespans in months, not decades or centuries, and the construction of a bridge is seen as a potentially-insurmountable technical challenge for any proposed railway construction (indeed, even by the 1950s, the cost of constructing a new bridge to cross the Ouse at South Lynn was treated as an oh-so-hard obstacle that justified the closing of the entire M&GN system in 1959). Meanwhile, the Victorians built things to last. PMY2 refers to the South Lynn to Yarmouth section of the M&GN (PMY1 is Peterborough to South Lynn). PMY means Peterborough, Melton Constable, Yarmouth. 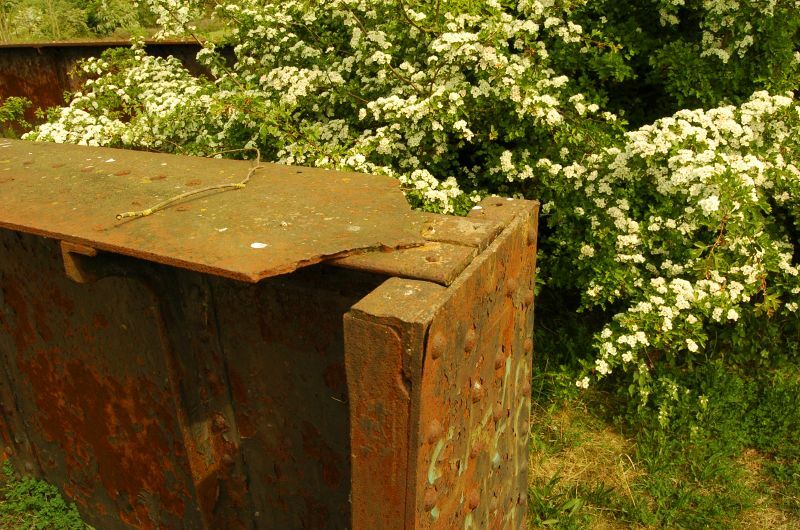 Rust. Kiev 88 and Arsat 80mm f/2.8, 1/60 at f/11, Kodak Ektar 100. Photo © Nick Youngman, all rights reserved, used here with his kind permission. Thanks Nick! Do check out his Flickr photostream for plenty of other railway photographs! Before you move on, be so kind as to pick out any large weed growths from the ballast, so that future generations can enjoy this bridge, too. Thanks! 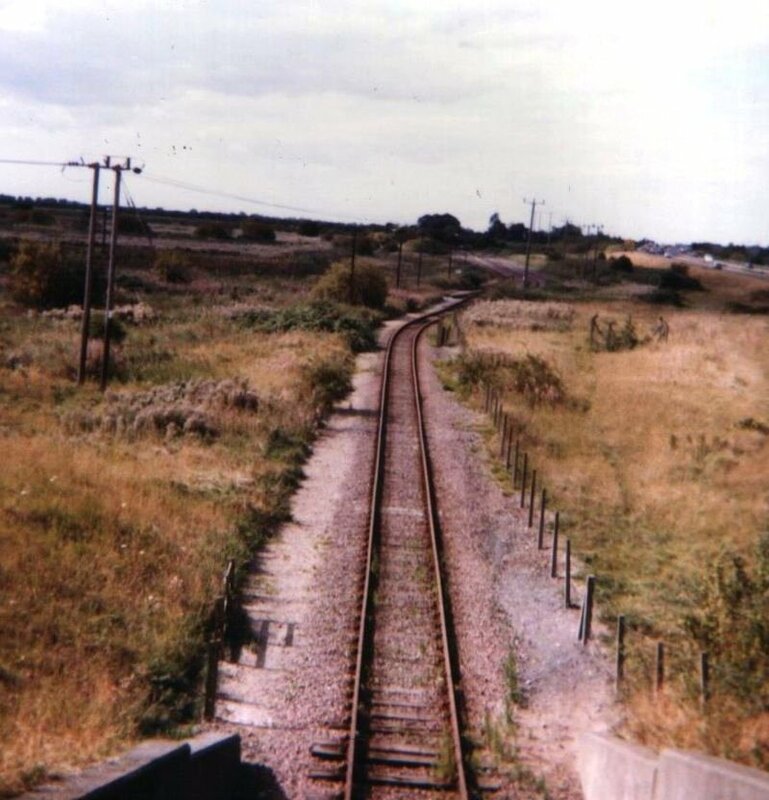 Here we're standing on the west side of the bridge, looking towards South Lynn junction (and the current Fen Line). 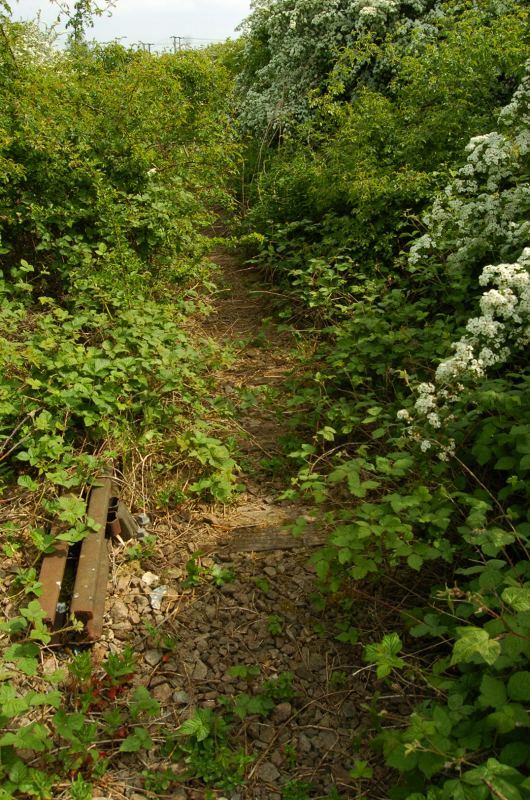 You can carry on walking down here; the undergrowth will stop you reaching the main line (or being seen by trains thereon). This comes a little too close to trespassing for comfort, but I did it anyway. Keep going down here enough, preferably with a pair of garden secateurs, and you'll come across a very short section of track. Hey, let's get some very small teddy bears in the house! 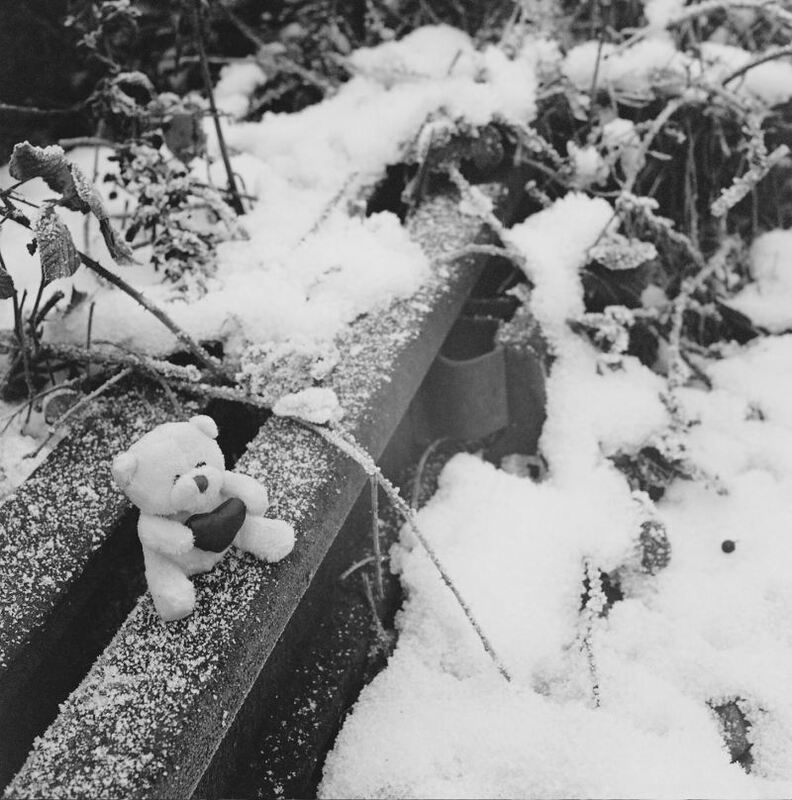 Tiny teddy waits for a train. Kiev 88 and Arsat 80mm f/2.8, 1/30 at about f/8, Kodak BW400CN. Note the double rail; this is a check rail, used on very sharp curves like this one to reduce the risk of derailment. 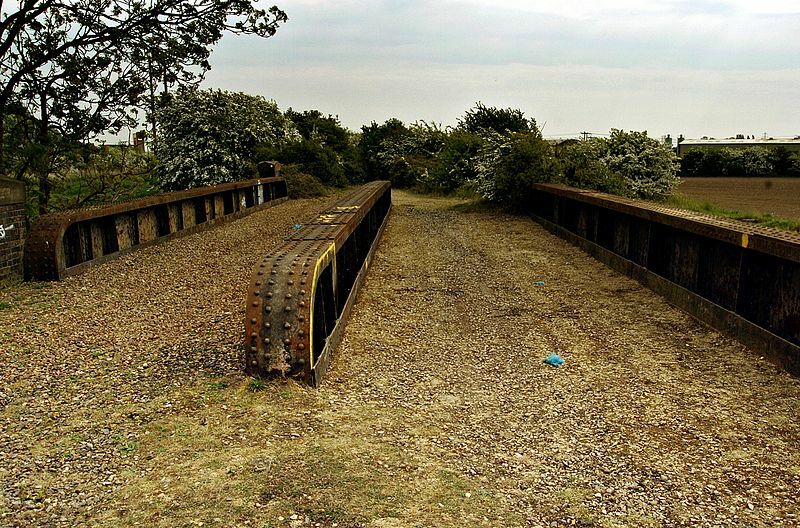 This was the bridge that once carried trains from South Lynn towards Yarmouth, Norwich, and many other places. Passenger services ended in 1959, but I believe it was used for freight services towards East Rudham until 1968 (this site tells me this is the case). 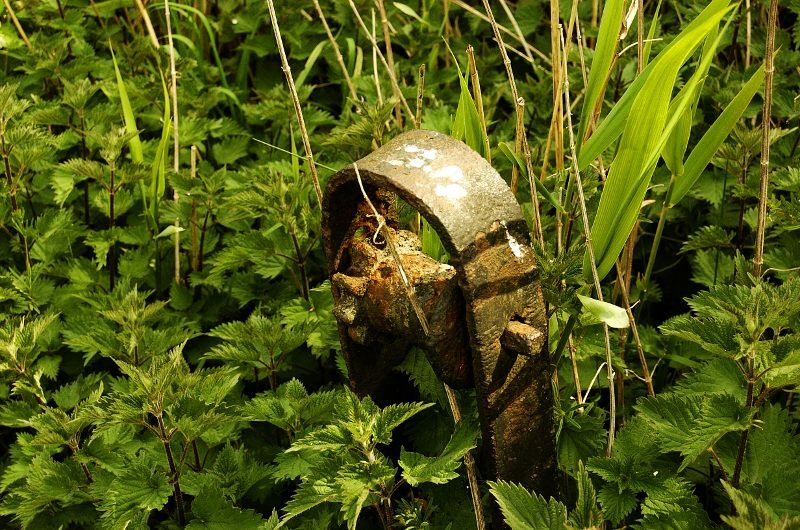 Photograph © Alan Moore (all rights reserved). Alan has an excellent website chock-full of great railway photographs, and who very kindly gave me permission to use this photo (shot on Agfa slide film) here. 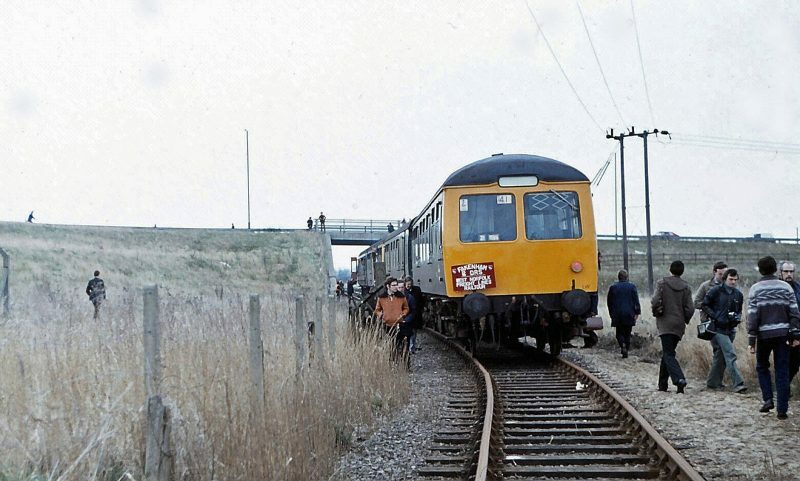 The plate on the front of the DMU reads "Fakenham & DRS West Norfolk Freight Lines Railtour". "Fakenham & DRS" means "Fakenham & Dereham Railway Society" which later evolved into the group that today runs the Mid-Norfolk Railway. A passenger train at South Lynn! 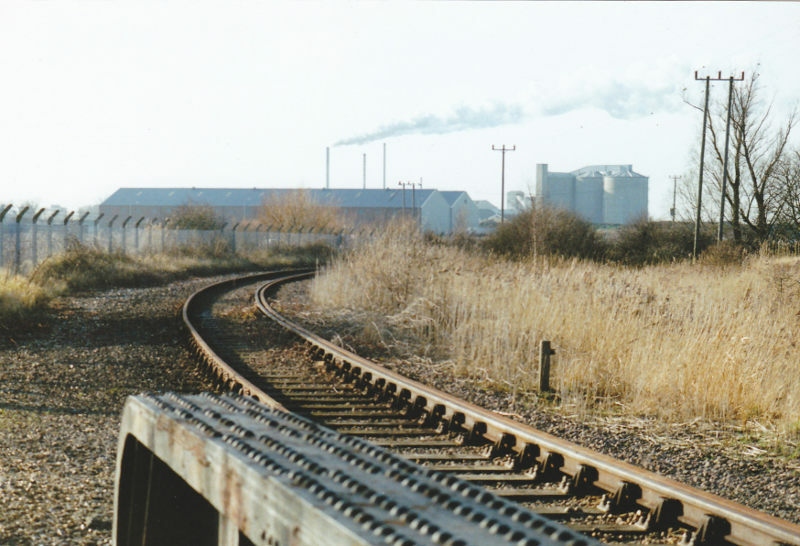 This was taken on the 29th of June, 1980, on the West Norfolk Freight Lines Railtour, which also visited the harbour branch and docks branch in Lynn, among other places. 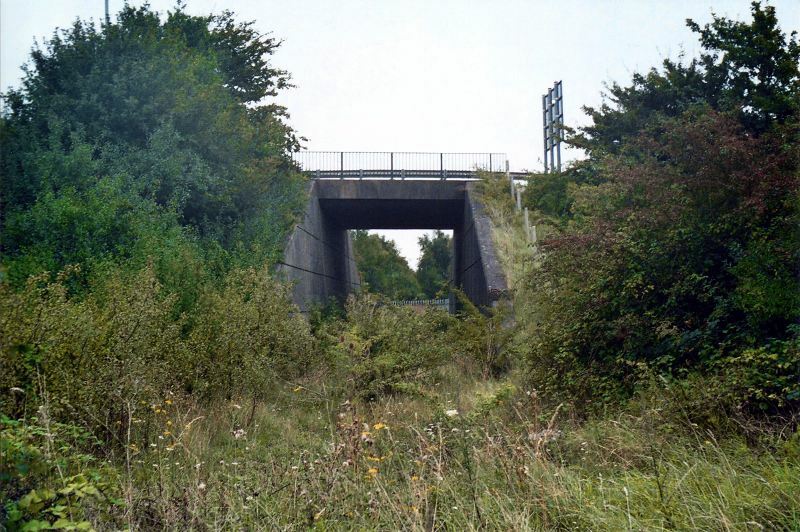 Alan informs me that the train could not go beyond this point; this page suggests that British Rail did not own the track from this point on. Photograph taken by Paul Miller, who graciously released a bunch of his old photographs under a license permitting redistribution. See tons more of them over here. Nick Youngman's notebooks name the date that track lifting began in these sidings, carried out by the scrap merchant Derek Miller, as the 26th of March 1995. Photo © Ray Bullock of the M&GN Circle, all rights reserved, used here with his permission. Thanks, Ray! This was a wonderful little bridge; mostly thick timber construction, with the critical parts of the deck made of steel. The interesting part is that on my final visit there, the steel girders were marked with "Lanarkshire Steel". This gives at least that part of the bridge an earliest date of 1889, which post-dates the original construction of the Harbour Branch by about four decades, implying that it was rebuilt at some point. Photo © Nick Youngman, all rights reserved, used here with his permission. Do check out his Flickr photostream for plenty of other railway photographs! 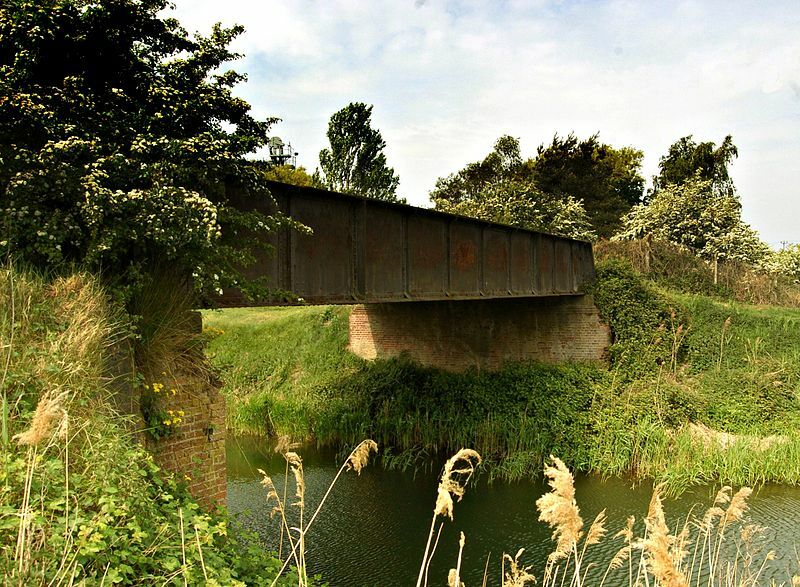 My hopes were very high that this bridge might be refurbished and become part of the footpaths around the developments on the Muck Works site in King's Lynn, and in fact rumours around the Environmental Agency (which manages the River Nar) said that this would be so. 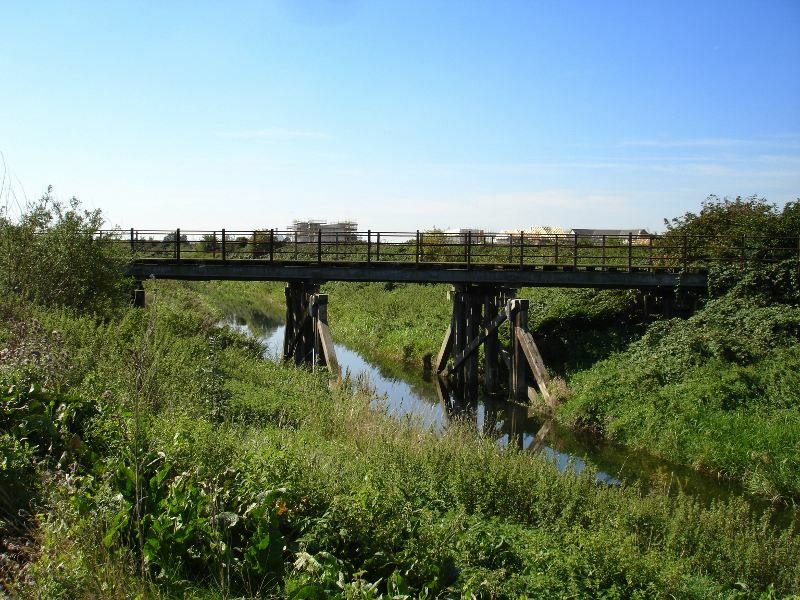 Sadly, it wasn't to be; this bridge was replaced and demolished some time around early 2011. You can find a spreadsheet with the details of thousands of such structures, with their codes, by doing a Google search for "dep2008-0475.xls". 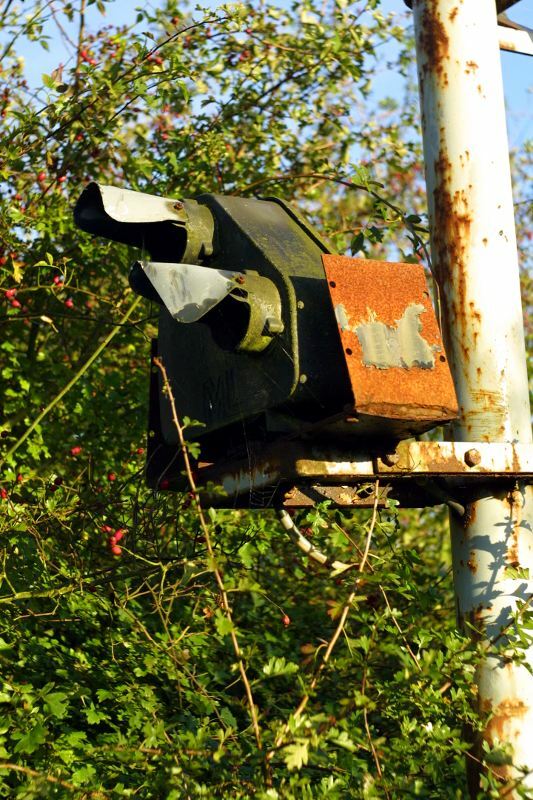 There's very little information out there on the Web about this little slice of British railway history, post-M&GN closure. I would very gratefully receive any information or photographs about the railways around South Lynn which I don't have on this page. You can reach me at lewiscollard@gmail.com. Of course, if you enjoyed this page and just want to tell me so, that's fine too! Thanks to all the people who have contributed notes and photographs. Additional thanks to Jenn for proof-reading this for me.